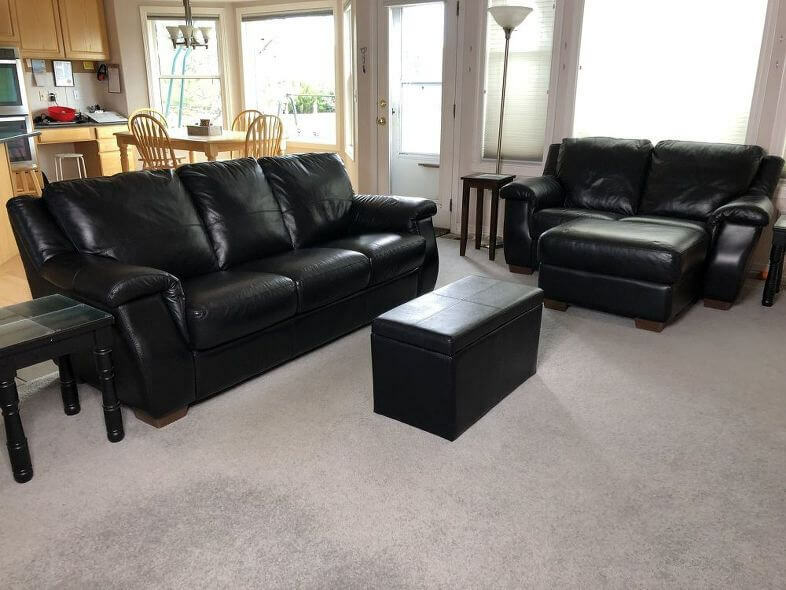 I did a tutorial on “How To Deep Clean Your Couch” awhile back and since then I have been asked – “What about leather couches?” We have leather couches in our home. 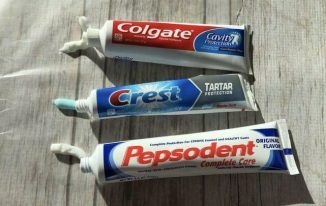 When you spend that kind of money, you want to take good care of them. 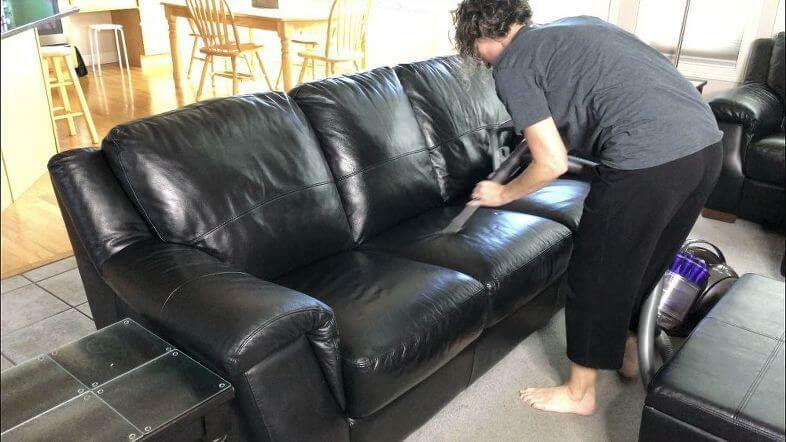 I thought I would share how we clean our leather couches with you. Here is our main leather couch. Before you start, there are so many different kinds of leathers, dyes, etc. Make sure to spot test your couch before jumping in. First thing I do is vacuum out all of the creases with a crevice tool. My cushions on this couch are attached. 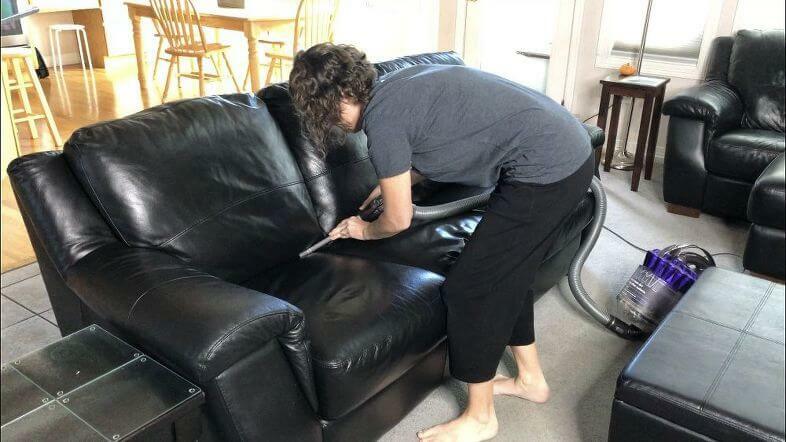 If your cushions can be removed, remove them and vacuum the entire base of the couch first. Next I vacuum the entire couch using the brush attachment. This helps get up all of the dirt and dust sitting on the couch. I use a damp microfiber cloth and wipe down the whole couch. I use a Norwex Envirocloth. 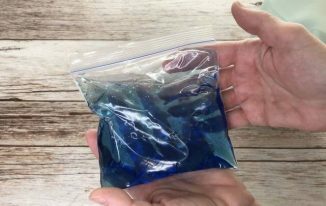 If you have some spill marks, use your microfiber cloth to carefully wipe those away. If you have an oil spot – blot it with a clean cloth and leave it alone. The oil will be absorbed by the leather over time. I follow that up with drying it off with a chamois. That is the basics for cleaning your leather couch. Bonus – Leather needs to be conditioned. 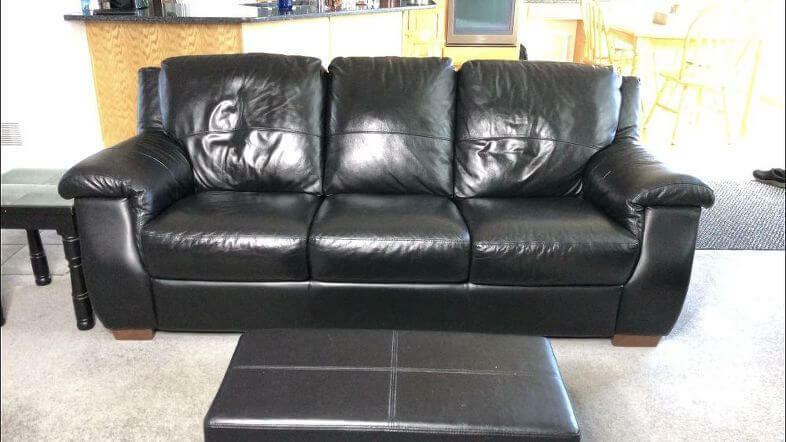 I strongly suggest buying a leather conditioner from a store that sells leather furniture. The conditioner will keep the leather from drying out and cracking, and protects it. 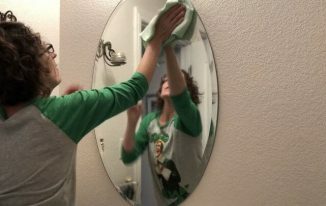 You only need to do this step once every 6 months to a year depending on your climate. Wow, that’s not too hard! Thanks for the tip about the conditioner. Our next couch is going to be leather, so I’ve been curious about caring for them. Thank you so much Michele, We love our leather couches. We have had this couch for about 10 years now, and it still looks great. Thank you, mine is 10 years old as well. We feel lucky it’s holding up as well as it is. We used to have a leather couch and it did last for years. I remember we had a pack when we bought it with a cleaning solution and conditioner which I did use occasionally! Maybe not ever 6 months though! 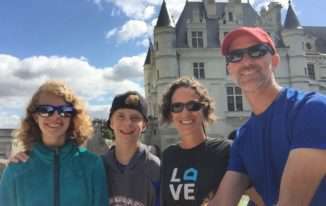 Thanks for sharing Julie and I think it depends on where you live and how dry the climate is. We live in a pretty dry climate and every 6 months is what the store we bought it from recommended to us. I know I have been known to let it slide from time to time. Life gets busy. We inherited a navy leather sectional and I try to take care of it as it would be expensive to replace!!! I didn’t know it would be that easy to take care of, but I have conditioned it. Thanks Donna and glad to hear you have conditioned it as that is the most important part. Our couches are 10 years old and going strong, I hope yours are holding up great as well.